I slept badly. Perhaps the lack of regular screaming from one or other infant gave rise to suspicions in my dozing mind. The pre-dawn found me scraping myself off my bleary-eyed mattress and heading down for a croissant. I'd already glanced out from my bedroom window and knew that there hadn't been an overnight frost, but it was still a welcome departure from the hotel car park: hop in the car and off, rather than 10 minutes of chipping away at the frozen windscreen like an ice sculptor in Harbin. I dogged out onto the payage, rather than playing chicken with the flying Frenchmen on the N74, and was at my first appointment on the dot. We have offered the wines of Louis Boillot before and I like them very much. I also like his wife's wines - Ghislaine Barthod is one of the finest exponents of Chambolle-Musigny - and I was therefore pretty chuffed to be invited to examine her 2007 range first up. Getting into the cellars was interesting, as a vast machine with caterpillar tracks was busy in the yard, digging out new cellars for husband and wife to share. Occasionally it wobbled alarmingly on the brink of the vast crater. I had visions of having to mount a rescue operation for its driver. Later on, having tasted through its incessant banging for the best part of an hour, I suspected that, had the worst come to the worst, I would have probably left him in his hole. 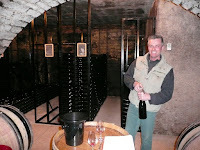 From the Barthod/Boillot cellars I headed off to Vosne to visit Etienne Grivot and had a superb tasting. Etienne seems increasingly relaxed and I can only put this down to confidence. When he describes himself in conversation as a fine wine maker, he does so with a total lack of arrogance. He stressed that there is more work to do, always more to learn, but the guy's basically happy in the skin of a supremely talented grape botherer. He spoke to me in English, for heaven's sake. This fact spoke almost more volumes than the conversation's content. From Grivot, I sped down to Nuits to visit the extremely sympa Christophe Drag at Domaine Jean Chauvenet. One village Nuits and, what, seven premiers crus? A lesson in terroir and its reaction to this new vintage. That took me up to 13h15 (perhaps Christophe thought I was someone more important, as hosting a tasting through a vigneron's lunch hour is rare as hens in hats), so there was just time for a sandwich raid on Carrefour before pitching up at the door of Faiveley, one of the most senior domaines in Burgundy and also one of the biggest landowners in the Côte. I hadn't visited the domaine since 1992 and was eager to reacquaint myself with their vast range. I just hoped that I wasn't going to be asked to taste all of it. I was given a tour of the cellar, a look at some of the 1.5 million stock bottles they're sitting on and then it was time to taste. Starting last vintage, there's been a stylistic change here, seemingly catalysed by Erwan, the 28 year-old scion of the Faiveley family who is gradually taking on more and more responsibility for the management of the estate. The family Faiveley have other, not insignificant interests. They make rolling stock for the TGV railway and I suspect that it's a great deal more lucrative than the wine side of things. Faiveley wines have, on occasion, been criticised for being too age-worthy. Many a punter has opened a bottle after a period in the cellar that would have rendered most wines of the Cote d'Or perfectly mature, only to find a brooding, slumbering monster within. The wind of change has blown and I must say that it seems to be kicking up some very pretty motes. Phew! No time to dawdle. I plunged on down the Cote and arrived at the domaine of Patrice and Michele Rion in good time. I have always loved Patrice's wines. They are so much the (brilliant) product of the man in their youth and so much the classic product of terroir in their maturity. It was a glittering range, rounded off with a curio: a Nuits-St-George Premier Cru white made from Chardonnay and Pinot Blanc and very delicious it was too. So what have I learnt? What style of wine has this difficult vintage thrown up for the waiting (I wish!) consumer. I love Burgundy and I love the style found in 2007 for it is, indeed, a very stylish vintage. The wines bear none of the stamp of excess heat or drought as have so many vintages of recent times. Average alcohol levels are 12.5% to 13.5%abv. The fruit has a heart-gladdening purity, a brightness, a freshness. And I hope people buy them, because they'll love them to bits. Stop and describe the wine that you'd really like to drink. What words do you use in that description? Rich? Powerful? They seem to be the "moment's" key epithets. How about beautiful, elegant, complex, ethereal, joyful, subtle and utterly lovely? I am describing the '07s I have tasted. And if I am ringing any bells, do yourself a favour. Prepare for a foray into this vintage and get ready, in the medium term, to thank yourself very much.